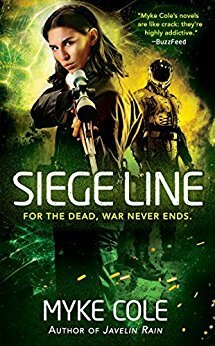 Siege Line is the third in Myke Cole’s ‘Reawakening’ trilogy. The first two books in the series looked at a world where magic was gradually returning, and in particular at an off-the-books government program which, as you might expect, picks up the magic, runs with it, and maybe takes it a bit too far. The first two books were fast-paced thrillers, liberally mixing magical weirdness with entirely plausible tactical action and emotionally raw characters. Siege Line picks up on these narrative traits, and dials them up to eleven. The action takes place across suburban Virginia and the somewhat less populated Canadian Northwest Territories. Virginia we’ve seen before, though the various government offices do manage to carry the whiff of glacial bureaucracy about them. That they also carry the scent of smart people doing important and occasionally lethal work is a credit to Cole’s tight and evocative prose. That prose gets a workout when it comes to dealing with the wilds of Canada. Cole brings the stark, pristine geography of the area to life. There’s a sense of the wilderness, of the potential for isolation, floating through the story at times, and it dovetails well with sime of the characterisation; our protagonist, Schweitzer, is increasingly isolated from his family, and from his humanity – and that social isolation is evoked and made more visible to the reader by placing it within a similarly lonely geography. By contrast, the treatment of the people of the Territories is positive and sympathetic. Living alongside the wilderness, they’re a people dependent on their own skills, and on each other, to get through the day. When the day involves black-ops government agencies and magicians, even more so. This is a town of flawed people, to be sure, but they’re all prepared to hang together. That spirit, that energy, is clear on the page – and helps bring the characters within to life. Speaking of the characters…well, for one, we’re back with Jim Schweitzer. Aside from having a name that’s fun to say, Schweitzer is an ex-SEAL, devoted to his family, and, well, dead. But he got better. Here, he’s a man with a mission – gutting the programme which brought him back from the dead. There’s a palpable sense of duty to Schweitzer, whose principled idealism works alongside his personal connections to his family to make him personable, and easy to empathise with. Of some interest is Schweitzer’s realisation that he’s increasingly disassociated from the things which have helped keep him human in the first two books – as he struggles to come to terms with his new un-life as a monster, and works to retain his essential humanity. As a hero, Schweitzer works well – and his internal conflicts both let him feel genuine and provide a great read. Then there’s Wilma 'Mankiller' Plante, sherriff of a town out in the Northwest Territories. I have to admit, as the book went on, I found myself looking forward to Plante’s sections more and more. She’s smart, pithy, witty, and capable. In a series which has the potential to be full of super-powered monsters beating on each other, Plante is an example of a normal, competent person, doing their job under increasingly dire circumstances, and doing it well. Siege Line is a book full of solid, convincing characterisation, and I bought into Plante’s almost immediately; she has an intensity and focus that sit alongside an unflinching emotional honesty that make her escapades a joy to read. There’s a colourful supporting cast as well – from surprisingly-wise senators, through Operators old and new, to CIA bureaucrats. Each is distinguishable, and memorable, and their efforts (and occasional demise) have an impact. The plot – as ever, we’ll try and stay spoiler free. But it’s a very well-paced book. There’s the building tension in the Canadian Territories, a sense of an unexpected storm coming in. Plante and her deputy walking the wilderness are our eyes on something which feels like it might get out of control. At the same time, Schweitzer is out there, trying to take on the Gemini Cell, bringing wrath and destruction down upon them. There’s the same kinetic gunplay and close quarters fighting which Cole encapsulated so well in his previous works, and here he once again writes some rock-solid, heart-pounding action scenes. The small unit tactics always seemed plausible to me as a reader, and it’s always nice to see characters acting thoughtfully about how to achieve their objective, military or otherwise. That the plausible action also has a cinematic edge, an artful sense of destructive space, a way of making it viscerally real – well, that’s great too. But whilst there really is a fair amount of fast-paced, stormingly good action here, it’s the quieter moments of character which make us care about the action. From Schweitzer’s meditations on who he wants or needs to be, through the thoughtful and considered treatment of First Nations culture and its impacts on Plante, to the emotionally charged, razor-sharp dialogue from Schweitzer and the mysterious Director of the Gemini Cell – there’s a humanity, or lack of it in play here which both keeps the reader invested and also quietly invites them to think about who they are and what they value. In the end, this is a smart, precision-crafted military thriller. It has great characterisation, solid worldbuilding and explosive action, and as such, I’m inclined to recommend it to fans of the series, without reservation. If you’re already invested in the adventures of Jim Schweitzer, then this is a book you owe it to yourself to read. If you’re coming to it fresh, I’d say it could work as a stand-alone, but you’ll get far more emotional context and investment if you go back and start at the beginning with “Gemini Cell” – trust me, it’s worth it.